Are you a custard lover or a custard hater? I’ve never found anyone in the middle of the road on the subject of egg custard pie. There are some people who prefer it warm to cold. My husband prefers it cold. Personally, I like it either way! Growing up, I never realized we had egg custard pie so often because there were so many eggs. I just always thought it was one of our family favorites. Ma Horton was known for her pies and cookie making. You can find her recipes I’ve shared in the “Recipes” menu. She taught my grandmother in turn she taught me. There is something comforting about the taste and texture of egg custard pie to me. I can almost smell it as the deliciousness wafts from Granny’s kitchen mixed with the smell of coffee and bacon from breakfast. My fondness for the pie could come from the memories I subconsciously associate with it. Of course, it could also be the deliciousness of Ma Horton’s recipe. Maybe even both! Either way, it is one of our favorites. My youngest son was the only one of the boys who joined me in my delight of this delicacy. He would often say, “Mama, will you make you and me a pie?” I knew what he meant. He loved to have it for breakfast and so do I! 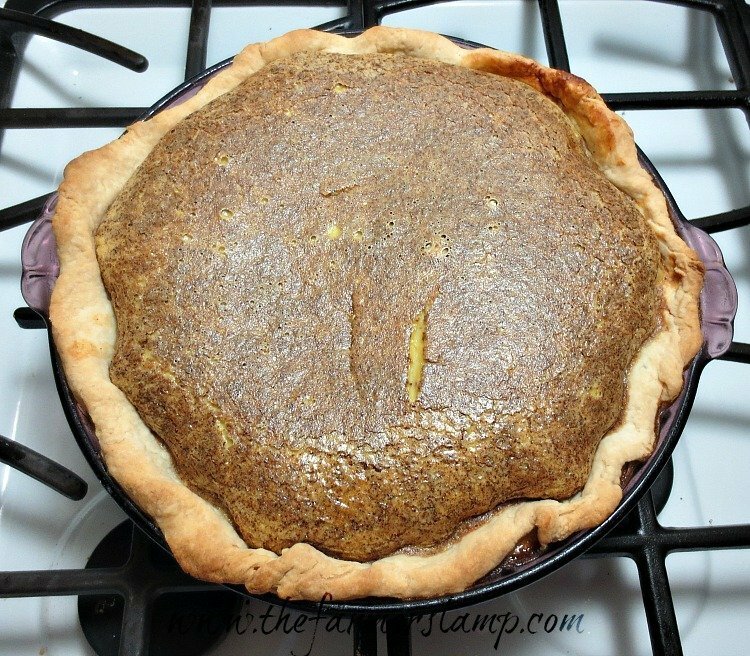 Egg custard pie is a good way to use up some of the spring and summer abundance your girls are giving you. Funny how so much of life happens around us when we’re children and not until we’re grown and carrying on the traditions do we realize there were some practical reasons behind their actions. That reminds me of a time when I was a young woman. We were having a family gathering at Papa and Granny’s. I wanted to impress her with the kitchen skills I had learned from her. I was preparing the ham for baking by cutting off the ends. My grandmother asked me what I was going to do with them. I told her nothing, make sandwiches I supposed. After a while, she asked me why I cut them off if I didn’t have a specific reason for doing it. When I told her I did it because she always did it that way she nearly fell down laughing at me! This brought the other women to see what she thought was so funny, especially since she wasn’t known for frivolity. Once she could talk again she shared my story with them. Then they all laughed. I was blushing by that time (blushing now as I remember it). She was finally able to tell me she had done that because her baking pan was often too short for the size ham Papa had brought in. I should say this recipe is supposed to make eight servings…I must guiltily say this isn’t usually the case here, unless we have company. You may have better control than me. Begin by preparing your favorite pie crust recipe. If you don’t have a favorite recipe, try mine. 1/8 teaspoon allspice (optional) – we enjoy it in the pie. 2. Using a wire whisk and a medium bowl, or electric mixer on medium, mix the eggs until well blended. Before we were off grid, I used my Vitamix. 3. Next, add the milk and sugar and blend well. Then add the vanilla, salt, and spices and mix well. 4. It’s a good idea to place your pastry lined pie plate on the oven rack and then pour the filling into it. This helps prevent any spilling. I also place a baking sheet under the pie while it cooks, just in case. 6. Reduce the oven temperature to 350° and continue baking for 10 to 20 minutes. Check every 5 minutes until a knife inserted halfway between the center and edge comes out clean. 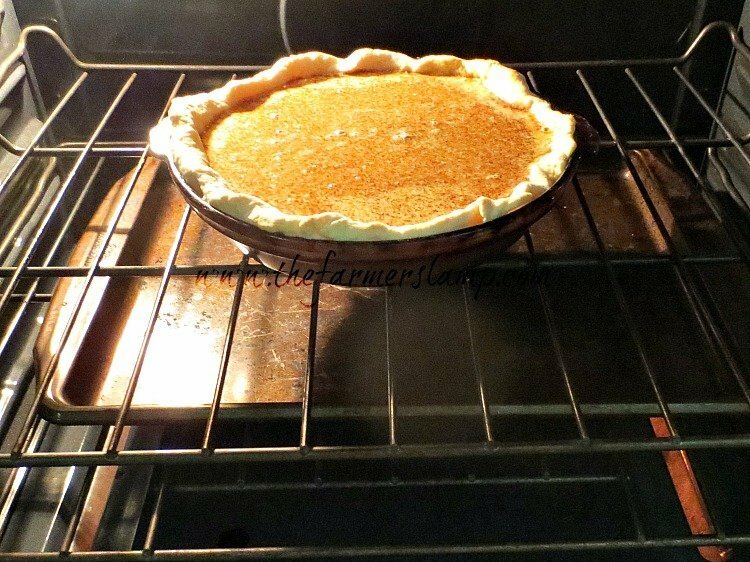 If you want to enjoy a warm slice, let the pie sit on a cooling rack for 15 – 20 minutes before slicing. Like I said we like it both ways, but J prefers his warm. Cover and refrigerate any pie you have left. This is of course assuming you have some left. Chilled pie is very nice, especially with hot coffee! If you prefer a chilled egg custard pie, let the pie sit for 15 minutes on your cooling rack. After 15 minutes, cover the pie and refrigerate for at least 4 hours. 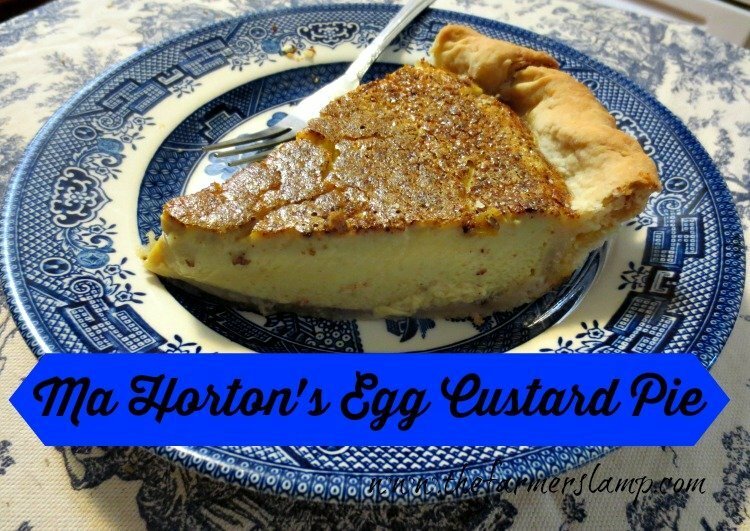 If you’ve never had egg custard pie before, I believe you’re in for a treat. Remember, a warm egg custard pie will be less firm than a chilled one so the texture of the two are slightly different. For those of you who are calorie conscious, one serving (if you use an 8 serving size slice) contains about 270 calories, at my best esitmation. But who’s counting? It’s egg pie, it has to be good for you. Right?